In the decades preceding the arrival of U.S. shale oil, the oil market had only one stabilizing force, namely OPEC. The reason the oil market was structured as such was due to the nature of conventional oil production, most non-OPEC oil production prior to U.S. shale oil fell in one of two categories: major offshore projects that took 5 to 7 years to build (North Sea, Gulf of Mexico … etc.) or mature conventional onshore fields (U.S. conventional fields, Russian Siberian fields … etc. ); both of these conventional oil supply sources were either non-responsive, or only slowly reactive, to changes in the oil price, major offshore oil projects tended to come online regardless of the oil price environment, while conventional onshore oil production with shallow decline rates (sub-10 percent) meant that even a slowdown in drilling would not impact total production in any meaningful way for an extended period of time. The aforementioned state of affairs meant that it was up to OPEC to adjust production to balance the market in case of abrupt supply or demand changes, OPEC had (and still has) the flexibility to withdraw millions of barrels from the market within a month or two if such a need arose (OPEC withdrawing 4m barrels from the market following the financial crisis in 2008/2009 is a case in point). The arrival of U.S. shale oil in size to the scene in 2014 has upended the OPEC/non-OPEC balancing act, by introducing a medium-term oil supply balancing mechanism that in the long run will prove supportive to the oil market, and especially so to non-shale oil producers. Shale oil which represented 70 percent of U.S. crude production on December 2014 (5.23M barrels) declined by 690K barrels, representing a 13 percent decline during that same time frame. U.S. shale oil production declined by 5.2 percent in the first year to 4.97M barrels (December 2015), and then declined by an additional 8.6 percent in the following year to 4.54M (December 2016). 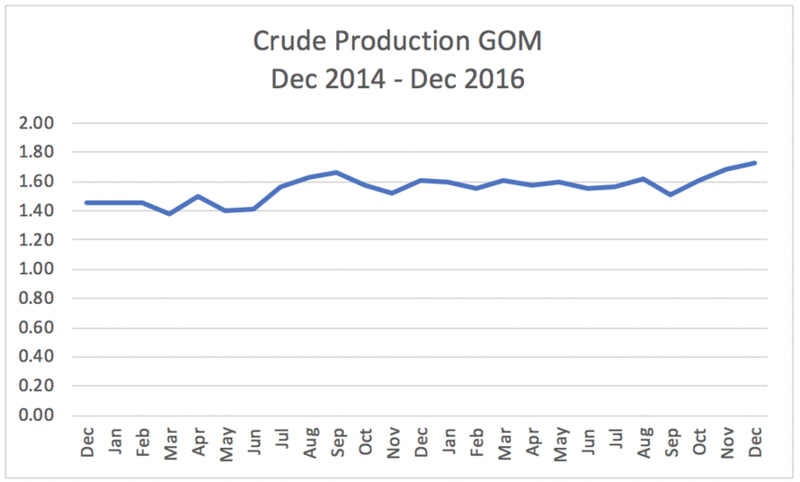 Please note the production swoon in May 2016 to 42.5M was mainly due to unplanned outages in Canada due to forest fires, and is not related to oil prices. As can be seen, both GOM and Non-OPEC (ex-U.S.) crude production were non-responsive to changes in oil prices. This is not to say these basins won’t respond to low oil prices - eventually, they will - but with a lag that could take between 3 and 5 years. We should see the impact of these declines by 2020 at the latest. It is clear that U.S. shale oil production is the most responsive free market oil to changes in oil prices. As U.S. shale oil production comes to represent a bigger piece of the pie in the global oil supply picture, its elastic characteristics will increasingly have a major impact on the global oil market. But before going into that let's take a closer look at the numbers (EIA data). In December 2014, U.S. shale oil production stood at 5.23M barrels, with a total monthly legacy decline rate of 300K barrels per month. The legacy decline rate is what U.S. shale producers must replace every month to keep production flat. Net U.S. shale oil production growth that month stood at 114K barrels, to achieve that growth 414K barrels were brought online, 72 percent of which went to compensate for legacy declines. Today U.S. shale oil production stands at 8.03M barrels, with a total monthly decline rate of 530K barrels. U.S. shale producers increased production by 114K barrels in December 2018; to achieve this, new production came in at 644K barrels, 82 percent of which went to compensate for legacy declines. This last point is key: with 82 percent of U.S. shale oil production going to replace declines (as compared to 72 percent in 2014), means only 18 percent of new U.S. shale oil production is contributing to the net growth in U.S. supply. Following the experience of 2015/2016, most market observers agree that U.S. shale production can’t grow meaningfully with WTI under $50 a barrel, WTI averaged under $50 both in 2015 ($48) and 2016 ($43). Thus, with WTI trading under $50 WTI today, it's fair to assume that U.S. shale growth will either slow in the coming months, or contract should prices remain here. As indicated earlier, U.S. shale oil production today is much larger, and with a much bigger legacy decline rate than in 2014; this means that a slight decrease in activity could have an outsized impact on total U.S. production. 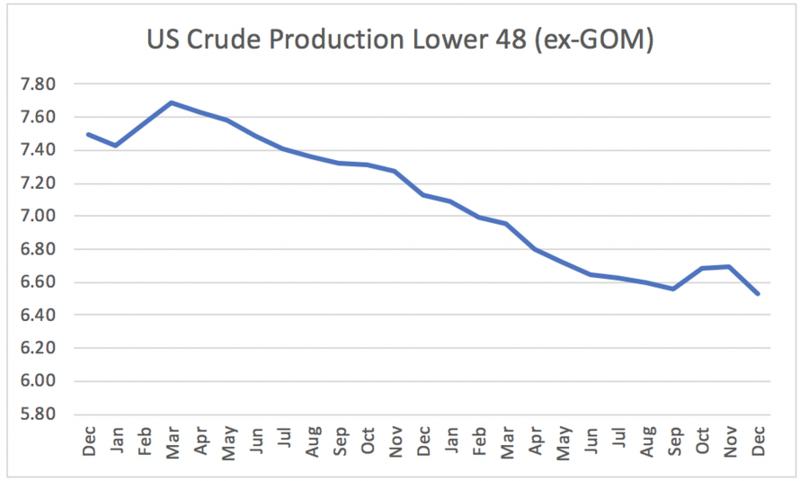 To illustrate this point, we can proceed with a theoretical example, if we were to assume the slowdown in U.S. shale activity was to slow new production growth from 644K barrels per month to 580K by the end of Q1/2019, the net annualized growth in U.S. production would decrease from roughly 1.3m barrels per year to 600K per year or a 54 percent decline. Obviously, the numbers are not static, the underlying legacy decline rate will eventually slow down as new production slows down, but directionally the example is very telling. 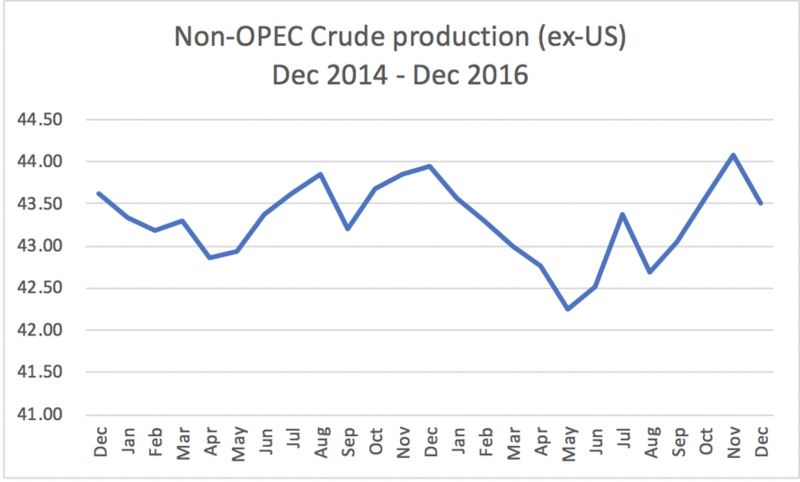 Furthermore, to put such U.S. decline in context, a slowdown of 50 percent in U.S. production growth would wipe out 51 percent of the expected 1.5m non-OPEC production growth projected for next year (IEA OMR December 2018). What’s important to keep in mind is that as U.S. production grows, and as legacy declines continue to cannibalize a larger portion of new U.S. shale oil production, U.S. production becomes increasingly sensitive to slight changes in drilling and completion activity. Those relatively small changes can have major implications for global oil balances. 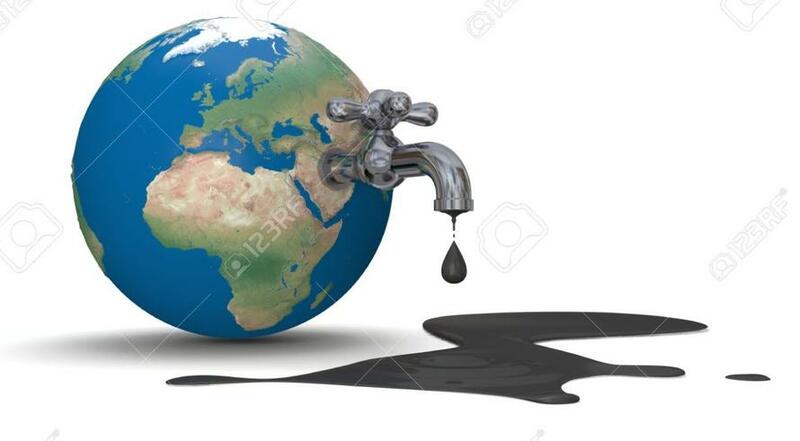 This situation is unprecedented in the history of the oil market for no global oil supply source has ever matched the sharp decline rate associated with U.S. shale oil production. As we have seen from the above, U.S. shale oil is highly responsive to changes in oil prices, this, in turn, introduces a new balancing force in the global oil market, a force that acts as a floor should prices decline under $50 a barrel (the economic threshold to produce shale oil). This same force also acts as a ceiling should prices rise above $70 WTI, with most shale fields becoming profitable at that price point. Contrary to conventional wisdom, the implications of the shale phenomenon are quite positive for non-shale oil companies. Its true that U.S. shale oil introduces an upper band to oil prices, however, this is not a negative since sharp spikes in oil prices are generally harmful for the global economy and for oil demand growth; this is especially the case in an age where electrified transportation is gaining market share. Most importantly, U.S. shale oil’s reactivity to price declines represents an economic floor to oil prices that will supplement OPEC efforts to balance the oil market: barring OPEC, oil prices could decline to extreme levels, exactly as happened in early 2016, with WTI trading as low as $26 a barrel with OPEC opting to stand still. Having a free market oil price stabilizing force as described is a boon for conventional producers, many of whom can generate strong returns within the $50-$70 shale oil price band. Prior to the arrival of U.S. shale oil, OPEC was the oil market only security lever, today U.S. shale oil present another lever. This added downside protection underpins non-shale operators’ cash flows during the lower leg of the cycle. As capital markets gain confidence in non-shale operators cash flows at the trough, the most dangerous part of the commodity cycle, valuations in the non-shale oil sector should increase, rather than decrease as they have been of late due to a fundamental misunderstanding regarding the balancing role of U.S. shale in the oil market. Longer term, U.S. shale oil’s upper band will cease to be a factor as U.S. shale oil production plateaus in the 9/10m barrels range in the early 2020s. In that ideal scenario, shale oil will continue to be a downside balancing force while losing its ability to cap the market on the upside due to logistical and geological constraints. Having U.S. shale oil downside protection without having it flood the market on the upside is a magnificent gift to OPEC, and other conventional oil producers.